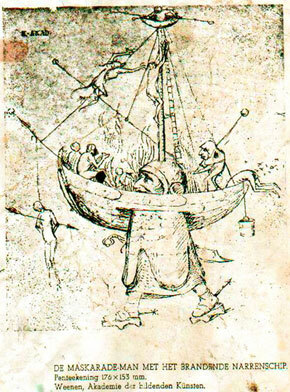 The Shyp Of Folys (Das Narrenschiff, Sebastian Brant, Basel, 1494) became the first bestseller in the history of literature and was received all over Europe as the ‘divina satira’. She was the apogee of a carnival tradition of a reversal of identities: The King is a Fool! “The Shyp Of Folys” became an universal image of mankind adrift, of society who realises that she has lost her bearing. While ringing his dunce bells the buffoon reversed the Divine Order and announced modernity. No longer earth was the centre of the universe nor Europe the centre of the world. These subversive notions have upset Europe, facilitating the revolutionary expansion that would encompass the continents and would explode the sciences. This is the contribution of the carnival traditions to the European heritage and the European contribution to the patrimony of humankind. On the occasion of the Dutch presidency of the Council of Europe the modern Ship of Fools “Azart” took the initiative to present the Council a monumental dunce bell that serves to silence boisterous member states. It is a power symbol resounding powerlessness and at the same time a monument of the playfulness of the ‘Homo Ludens’ singing a praise to folly. On May 12 2004 Dutch Foreign Minister Bot presented this bell to his successor.